Originally published in 1907 by Kegan Paul, Trench, Trubner & Co., Ltd., London. How the desire of this soul grew when God showed her the neediness of the world. How finite works are not sufficient for punishment or recompense without the perpetual affection of love. How very pleasing to God is the willing desire to suffer for Him. How virtues are proved and fortified by their contraries. How the affection should not place reliance chiefly on penance, but rather on virtues; and how discretion receives life from humility, and renders to each man his due. A parable showing how love, humility, and discretion are united; and how the soul should conform herself to this parable. How penance and other corporal exercises are to be taken as instruments for arriving at virtue, and not as the principal affection of the soul; and of the light of discretion in various other modes and operations. How this soul grew by means of the divine response, and how her sorrows grew less, and how she prayed to God for the Holy Church, and for her own people. How God grieves over the Christian people, and particularly over His ministers; and touches on the subject of the Sacrament of Christ's Body, and the benefit of the Incarnation. How sin is more gravely punished after the Passion of Christ than before; and how God promises to do mercy to the world, and to the Holy Church, by means of the prayers and sufferings of His servants. How the road to Heaven being broken through the disobedience of Adam, God made of His Son a Bridge by which man could pass. How God induces the soul to look at the greatness of this Bridge, inasmuch as it reaches from earth to Heaven. How this soul prays God to show her those who cross by the aforesaid Bridge, and those who do not. How this Bridge has three steps, which signify the three states of the soul; and how, being lifted on high, yet it is not separated from the earth; and how these words are to be understood: "If I am lifted up from the earth, I will draw all things unto Me." How this Bridge is built of stones which signify virtues; and how on the Bridge is a hostelry where food is given to the travelers; and how he who goes over the Bridge goes to life, while he who goes under It goes to perdition and death. How traveling on both of these roads, that is the Bridge and the River, is fatiguing; and of the delight which the soul feels in traveling by the Bridge. Of the words that Christ said: "I will send the Holy Spirit, who will reprove the world of injustice and of false judgment;" and how one of these reproofs is continuous. How the Devil gets hold of souls, under pretense of some good: and, how those are deceived who keep by the river, and not by the aforesaid Bridge, for, wishing to fly pains, they fall into them; and of the vision of a tree, that this soul once had. An exposition on Christ's words: "Whosoever thirsts, let him come to Me and drink." How this devoted soul looking in the Divine mirror saw the creatures going in diverse ways. How servile fear is not sufficient, without the love of virtue, to give eternal life; and how the law of fear and that of love are united. How, by exercising oneself in servile fear, which is the state of imperfection, by which is meant the first step of the holy Bridge, one arrives at the second step, which is the state of perfection. Of the imperfection of those who love GOD for their own profit, delight, and consolation. Of the way in which GOD manifests Himself to the soul who loves Him. Why Christ did not say "I will manifest My Father," but "I will manifest myself." How the soul, after having mounted the first step of the Bridge, should proceed to mount the second. How an imperfect lover of GOD loves his neighbor also imperfectly, and of the signs of this imperfect love. Of the means which the soul takes to arrive at pure and generous love; and here begins the Treatise of Prayer. Here, touching something concerning the Sacrament of the Body of Christ, the complete doctrine is given; and how the soul proceeds from vocal to mental prayer, and a vision is related which this devout soul once received. Of the method by which the soul separates herself from imperfect love, and attains to perfect love, friendly and filial. Of the signs by which the soul knows she has arrived at perfect love. How they who are imperfect desire to follow the Father alone, but they who are perfect desire to follow the Son. And of a vision, which this holy soul had, concerning diverse baptisms, and of many other beautiful and useful things. How worldly people render glory and praise to GOD, whether they will or no. How even the devils render glory and praise to GOD. How the soul, after she has passed through this life, sees fully the praise and glory of My Name in everything, and, though, in her the pain of desire is ended, the desire is not. How after Saint Paul was drawn to the glory of the blessed, he desired to be loosened from the body, as they do, who have reached the aforesaid third and fourth states. How the soul who finds herself in the unitive state desires infinitely to have the barren earthly state and unite herself to GOD. How they, who are arrived at the aforesaid unitive state, have the eye of their intellect illuminated by supernatural light infused by grace. And how it is better to go for counsel for the salvation of the soul, to a humble and holy conscience than to a proud lettered man. How this devout soul seeks knowledge from God concerning the state and fruit of tears. How there are five kinds of tears. Of the difference of these tears, arising from the explanation of the aforesaid state of the soul. How the four stages of the soul, to which belong the five aforesaid states of tears, produce tears of infinite value: and how God wishes to be served as the Infinite, and not as anything finite. Of the fruit of worldly men's tears. Of those who have placed their desire rather in the mortification of the body than in the destruction of their own will; and of the second light, more perfect than the former general one. Of the third and most perfect state, and of reason, and of the works done by the soul who has arrived at this light. And of a beautiful vision which this devout soul once received, in which the method of arriving at perfect purity is fully treated, and the means to avoid judging our neighbor is spoken of. In what way they, who stand in the above-mentioned third most perfect light, receive the earnest of eternal lift in this life. 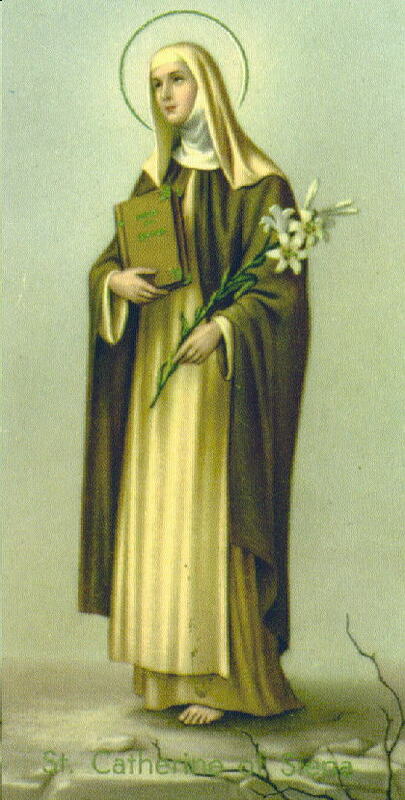 How this soul, rendering thanks to God, humiliates herself; then she prays for the whole world and particularly for the mystical body of the holy Church, and for her spiritual children, and for the two fathers of her soul; and, after these things, she asks to hear something about the defects of the ministers of the holy Church. How God renders this soul attentive to prayer, replying to one of the above-mentioned petitions. Of the dignity of the priest; and of the Sacrament of the Body of Christ; and of worthy and unworthy communicants. How the bodily sentiments are all deceived in the aforesaid Sacrament, but not those of the soul; therefore it is, with the latter, that one must see, taste, and touch It; and of a beautiful vision this soul had upon this subject. Of the excellent state of the soul who receives the sacrament in grace. How the things which have been said about the excellence of this Sacrament, have been said that we might know better the dignity of priests; and how God demands in them greater purity than in other creatures. Of the excellence, virtues, and holy works of virtuous and holy ministers; and how such are like the sun. A brief repetition of the preceding chapter; and of the reverence which should be paid to priests, whether they are good or bad. Of the difference between the death of a just man and that of a sinner, and first of the death of the just man. Of the death of sinners, and of their pains in the hour of death. How this devout soul, praising and thanking GOD, made a prayer for the Holy Church. Here begins the treatise of obedience, and first of where obedience may be found, and what it is that destroys it, and what is the sign of a man's possessing it, and what accompanies and nourishes obedience. How obedience is the key with which Heaven is opened, and how the soul should fasten it by means of a cord to her girdle, and of the excellences of obedience. Here both the misery of the disobedient and the excellence of the obedient are spoken of. Of those who have such love for obedience that they do not remain content with the general obedience of precepts, but take on themselves a particular obedience. How a soul advances from general to particular obedience; and of the excellence of the religious orders. Of the excellence of the obedient, and of the misery of the disobedient members of the religious orders. How the truly obedient receive a hundredfold for one, and also eternal lift; and what is meant by this one, and this hundredfold. Of the perversities, miseries, and labors of the disobedient man; and of the miserable fruits which proceed from disobedience. How God does not reward merit according to the labor of the obedient, nor according to the length of time which it takes, but according to the love and promptitude of the truly obedient; and of the miracles which God has performed by means of this virtue; and of discretion in obedience, and of the works and reward of the truly obedient man. This is a brief repetition of the entire book. How this most devout soul, thanking and praising God, makes prayer for the whole world and for the Holy Church, and commending the virtue of faith brings this work to an end. Letter of Ser Barduccio di Piero Canigiani, containing the Transit of the Seraphic Virgin, Saint Catherine of Siena, to Sister Catherine Petriboni in the Monastery of San Piero a Monticelli near Florence. In the Name of Jesus Christ.